There's growth in the DIAs market. Sales for DIAs were $2.7 billion in 2014, a 22 percent increase over 2013. 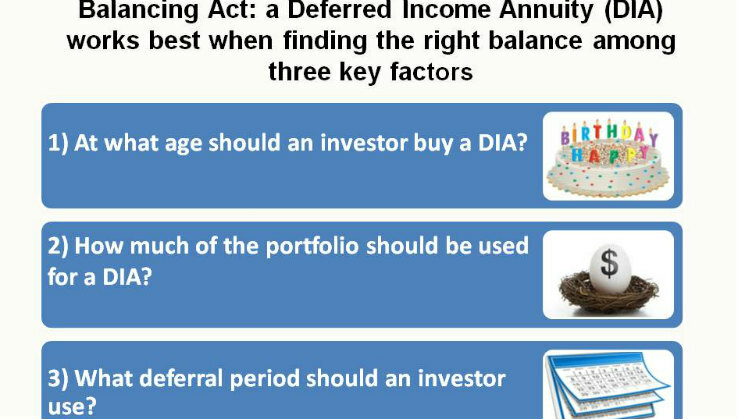 LIMRA Secure Retirement Institute has just released a study on key factors to consider when purchasing a deferred income annuity (DIA) to secure income in retirement. While DIAs represent a small portion of the overall annuity market, their potential is growing. Sales for DIAs were $2.7 billion in 2014, an increase of 22 percent over 2013. Companies that sell them market DIAs as “income later” products, meaning individuals buy them today for a guaranteed lifetime income beginning at some point in the future. The demand for a secure income stream in retirement is well established. According to an earlier Institute study, 7 in 10 retirees and pre-retirees said having enough money to last their lifetime is a top priority and two thirds want to remain financially independent in retirement. DIA buyers tend to average between age 55 and 62 and for the most part have not yet retired. The average deferral periods for DIA buyers range from 7 to 10 years and around 70 percent of DIA contracts use qualified savings such as IRA rollovers. The average investment amount is $147,000. Like most financial products, a DIA is not a “one-size-fits-all” transaction. Institute researchers ran several scenarios of various DIA purchases to determine how consumers can optimize their investment and keep their income secure for a 30-year retirement. 1) At what age should an investor buy a DIA? 2) How much of the portfolio should be used for a DIA? 3) What deferral period should the investor use? It would be easy to assume that a sizable investment in a DIA, deferred for several decades would generate the best results, but the analysis suggests otherwise. Investing too much or too little, or deferring too soon or too long, can prevent purchasers from getting the most out of their DIAs. A natural question for advisors and clients to ask when considering a DIA is: How big is the payout? The research suggests that a better question is: How well does income from the DIA work with the investor’s portfolio to increase the security of their income in retirement?